I am from Libertyville, Illinois (suburb of Chicago). I attended Truman State University to study English, Psychology, and Education. Since 2011, I have taught in Missouri: Southeast Missouri and St. Louis Suburbs. In 2016, I accepted a position with Truman State University (building administrator). In my free time, I enjoy writing, reading, and spending time with my family. Across the nation, schools are searching for methods to empower students, establish community, and prepare them for the real world. For some schools, the primary objective is to convince students to attend school, while other schools worry about over stressing their students. 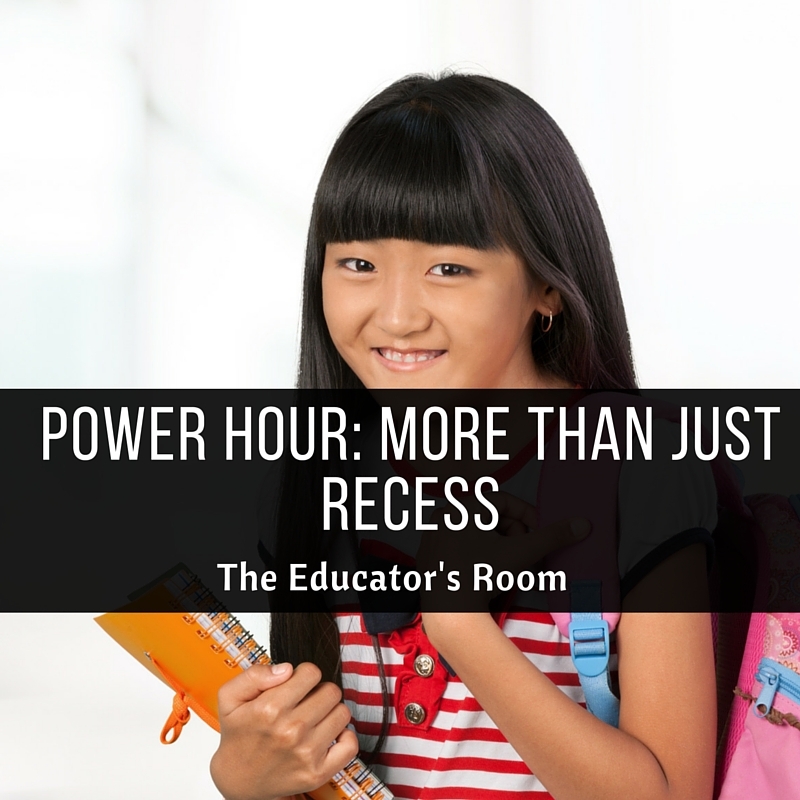 Power Hour, a school-wide “free” hour, allows students to take ownership over their educational experience; schools using this tactic have observed higher student achievement, fewer discipline problems, and healthier behaviors. During Power Hour, the entire school takes a “break.” Within the hour, students are to eat lunch and participate in various programs: resource centers, tutoring, club meetings, study hall, etc…Teachers, students, and administrators can collaborate in order to create a system tailored to the specific school that benefits every student. This system can have tiers of privileges, consequences, and rewards. For the past two years, a collaborative team at my high school has developed a Power Hour (renamed “Tiger Time”). In their plan, students have zone options: lunch, social, and study. Obviously, students will report to the cafeteria for lunch, but it is no longer the sole social area; students can continue to interact with peers in the gym, theatre, and courtyard. These locations allow students to build relationships by talking, playing games, and relaxing with one another. For study areas, students will be able to choose between the library, computer lab, curriculum resource centers (staffed by a teacher), quiet study hall and group study hall rooms. Additionally, certain rooms will be designated club and activity meeting locations. Students who are passing all classes will be allowed to move around locations as they see fit. For students who have D’s and/or F’s in classes, they will be required to check in to a study location for a minimum of thirty minutes. Currently, a lunch detention is fifteen minutes (hardly an inconvenience), but during the proposed Tiger Time, lunch detentions will be an entire hour (students will eat lunch in the room). Teachers and administrators will rotate roles: monitors and facilitators. Our lunchtime will increase to thirty minutes, and during the other half hour, we will be assigned to one of the zones. The flexibility in schedule allows teachers to utilize their strengths; some teachers may prefer to socialize with students, while others may prefer to lead a resource room. Community Building: In 2014, Principal Jayne Ellspermann wrote an article for Principal Leadership that discussed the Power Hour successes at West Port High School in Florida. Ellspermann noted that students arranged band and dance performances. Students play intramural sports during the hour. They are no longer just grouped by cliques and class schedules; they bond through common interests. Increased Student Involvement: Some students’ extracurricular activities are limited by schedules; they can’t be on the speech and soccer teams due to scheduling conflicts. By opening up an hour during school, students can hold club meetings and not interfere with after school schedules. Students who need to work can still be involved in interest clubs; the theatre director can call an extra rehearsal; coaches can meet with athletes in small groups to work on a skill; Model UN can host an additional mock trial; clubs and teams can have extra bonding time (club/sport potluck). Ellspermann reported over half of West Port High School students were involved in an activity by the end of the first year of Power Hour. They can have it all. Stronger Student-Teacher Relationships: Some days I find it difficult to mentor my students because they want to have a personal conversation during class time. I hate asking them to come back later, and worse, sometimes I can’t find a time to address their needs. With Power Hour, I can arrange a time to meet with them. Teachers initiate extended class time: continued discussions, mini-seminars (How to Write a College Application Essay, How to Effectively Use the Planner, Different Ways to Study for Tests, etc…). Schools can create mentor programs and strengthen advisory programs. Counselors can meet with students without pulling them from classes. Learning will be enhanced, not interrupted. Formation of Study Groups: With the nonconstructive time, students create new opportunities to further their education. They strive to complete most of their homework during the school day, so they can relax at home. Instead of relying on the students in their specific class, they can reach out to students in the same course but different sections; they can discuss the differences in teachers’ approaches to the lesson. Group collaboration is no longer a scheduling nightmare. Students begin learning from each other, and isn’t that our ultimate aspiration? Decreased Number of Failing Students: One of my school’s interventions is after school tutoring: every Wednesday, my students know they can meet me in the library for extra help. According to policy, students are allowed to retake or revise assessments for a higher grade. Attendance is mediocre at best. Honestly, my honors (who are not failing) most frequently take advantage of my time. Typical excuses are “I have to work after school,” “I have practice” and (my favorite) “I have better things to do.” Imagine how many students would accept help if it was offered during the day and didn’t coincide with after school free time? Additionally, administrators and teachers can more effectively monitor students during Power Hour; if a failing student doesn’t show up to tutoring, he will spend time in lunch detention until his grade is raised. Currently, my students who avoid after school tutoring have no consequences other than a low grade. Furthermore, if a tier system is established, students want the freedom of planning their Power Hour, so they strive to keep passing grades. In her article, Ellspermann reported that student course failures dropped below 5%. Social time is one of the greatest motivators. Decreased Discipline Referrals: One of our neighboring districts uses Power Hour, and its lunch detention room overlooks the cafeteria. The assistant principal noted that students don’t stay in detention for long because they can’t stand watching their classmates have freedom. Since the students aren’t being treated like caged animals with only small bursts of breaks, their pent up energy is released during the day. With a midday break, they can motivate themselves to focus in the morning. Ellspermann stated that by the end of the first year disciplinary referrals were drastically reduced (approximately by 50%). My neighboring high school reported increased attendance. Positive community atmosphere and student freedom changes attitudes about school. The teacher who heads my school’s committee is passionate about Power Hour because she has watched the transformation in her son. “He is learning life skills about priorities and time management. He and his friends have a plan: lunch, study, and basketball game. Some days he needs more study time, so he misses the basketball game, but most days the prospect of a pick-up basketball game is what keeps him focused. When he comes home, he’s allowed to be a kid; he can focus on sports and family. He is much happier.” As a college Resident Assistant, I watched freshmen struggle with the freedom of college. They didn’t know how to budget their time; they didn’t know how to prioritize. Unfortunately, some students failed to balance social and academic life, and they were asked to leave the university. Power Hour develops these skills and allows adults to monitor effectiveness. We can intervene when necessary and help students become independent. The entire system empowers students to take responsibility for their actions. Is there any lesson more relevant for today’s students? After two years of hard work, the committee is planning a trial Power Hour for next school year. It has been a long and trying road. Originally, administrators and teachers were hesitant about the idea because they couldn’t see past the recess concept. Several faculty members visited the neighboring district to see Power Hour in action and to listen to testimonials of students and teachers. Note that the process requires research, planning, and revision. It all begins with one person voicing the idea.